St Matthews Police Department was hand typing all citations before the 4910LR DL Reader was implemented. Learn about their results with e Citation and the 4910LR here. 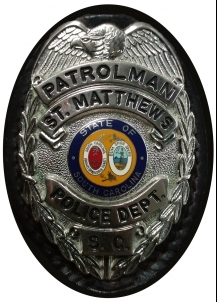 The Police Chief at St Matthews requested a 4910LR T&E unit and gave it to one of his patrol officers for a test run. Due to budget constraints, the department did not have funds to purchase the 4910LR scanner. The Officer loved the 4910LR DL reader so much, he offered to purchase it out of his own pocket.
" I love how you push the button one time and it reads the license. I probably went from writing 10 citations a week to 30 with my new [4910LR] scanner. " 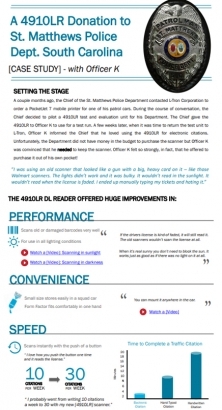 See all the benefits St Matthews Police Department is now experiencing by switching to e citation with the 4910LR DL Reader. Fill out the form below. Once the form is submitted, you will be able to download and view this case study. This case study is viewable on all of your devices.